An open cafeteria is more like a café, with casual bar stool seating, upholstered booths, and family-style tables surrounded by yellow Tip Ton chairs by Vitra. Left: Semi-enclosed spaces on both levels are for low key meetings. Flooring is by Bolon, and the matching benches are upholstered in Maharam’s Messenger in Lumine. Right: An open stairway and wood-clad columns connect the two levels. For the ceiling, the firm created a striated canopy out of timber planks. Semi-enclosed spaces on both levels are for low-key meetings. Flooring is by Bolon, and the matching benches are upholstered in Maharam’s Messenger in Lumine. L.A. architect Clive Wilkinson has created a flexible, nature-inspired hub for Microsoft’s Vancouver office. In the hometown of Microserfs author Douglas Coupland, one might expect a company like Microsoft to tap, at least ironically, a bit of the “geek house” Coupland’s dystopian novella described so well. Nothing could be further from the truth, though. 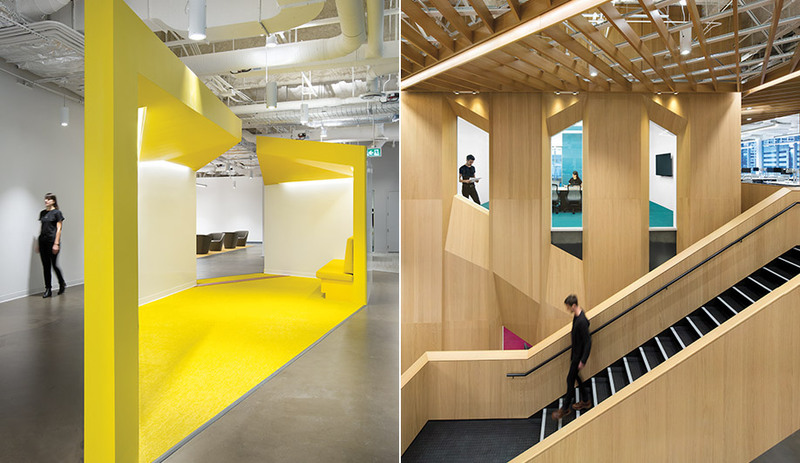 For its western Canadian headquarters, the Silicon Valley giant invited L.A. architect Clive Wilkinson to spin a narrative that is part nature-inspired utopia and part brave new office space. 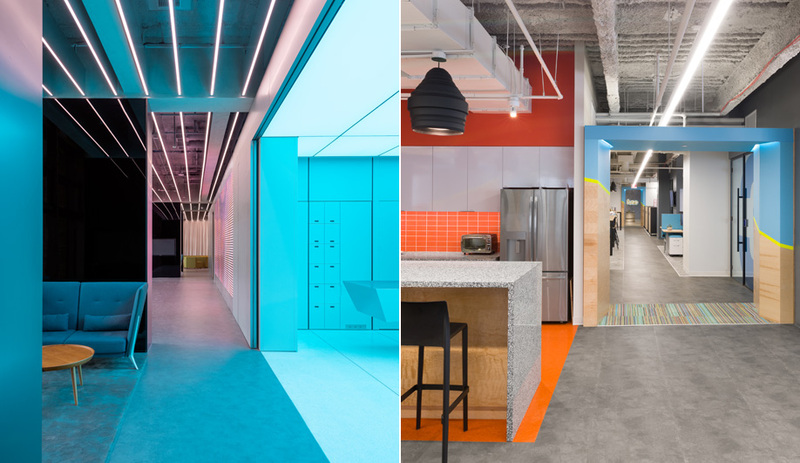 Located in central Vancouver, the 13,200-square-metre hub occupies two floors of a late-1970s building that was recently transformed and reskinned in glass. Open to civic panoramas of Arthur Erickson’s iconic Robson Square, the interiors play on the idea of roots and branches: granite bedrock and forest canopy reaching for the sky. 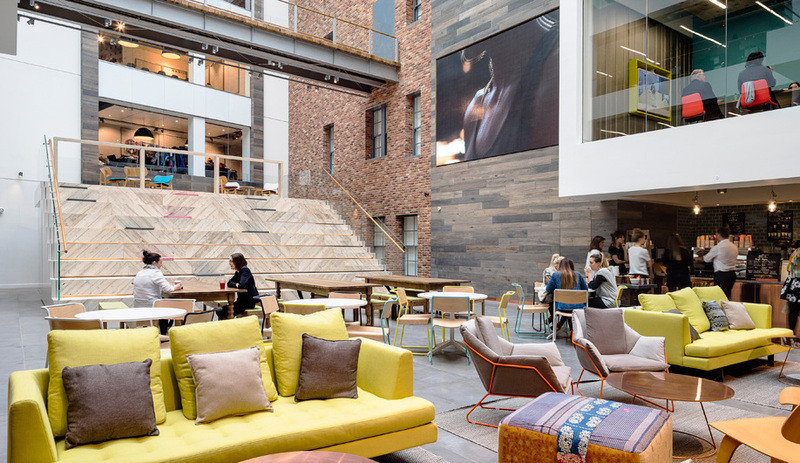 The brief was to create flexible spaces for upwards of 745 employees, and to offer them a variety of ways to work. 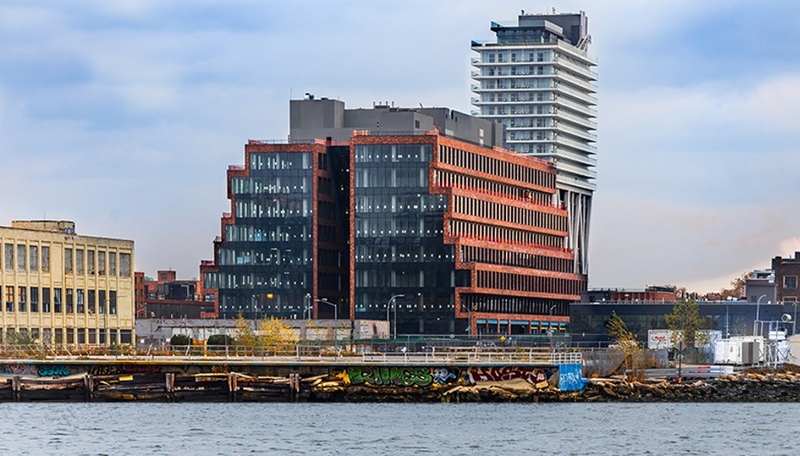 The space also had to determine a “rationalized orientation.” Inviting a game of urban wayfinding, Wilkinson chose to place landmarks along circulation pathways that converge at a pivotal stairwell that links the two floors. The journey downstairs into a raised café area has a sense of procession, while the walk up gives clear views of a robust timber-planked canopy. The lower floor is primarily for social activities and casual meetings, but also includes work areas. 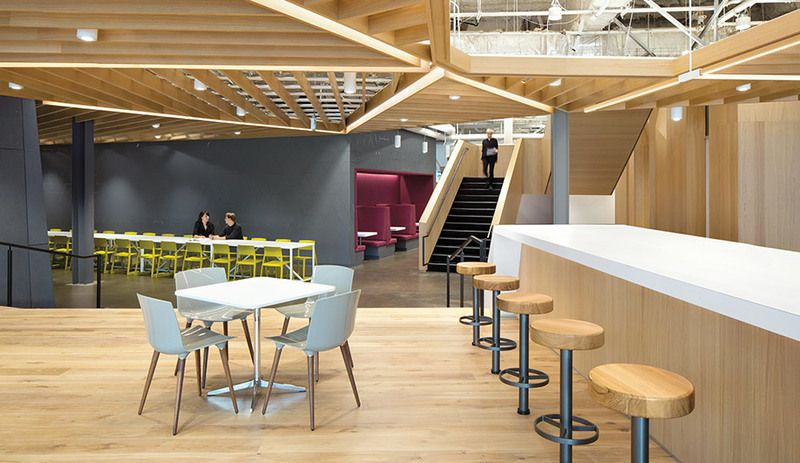 Its open layout features polished concrete circulation pathways, and soaring white oak-veneered columns that continue from the lower floor to the upper, and illustrate a tree-like formation connecting the two. One flight up, the feeling is structurally lighter and airier. The exposed lattice-like wooden rafters – and the pops of yellow, green and blue found in the furniture and on the floors and walls – project a fresh, almost cheery, mood. 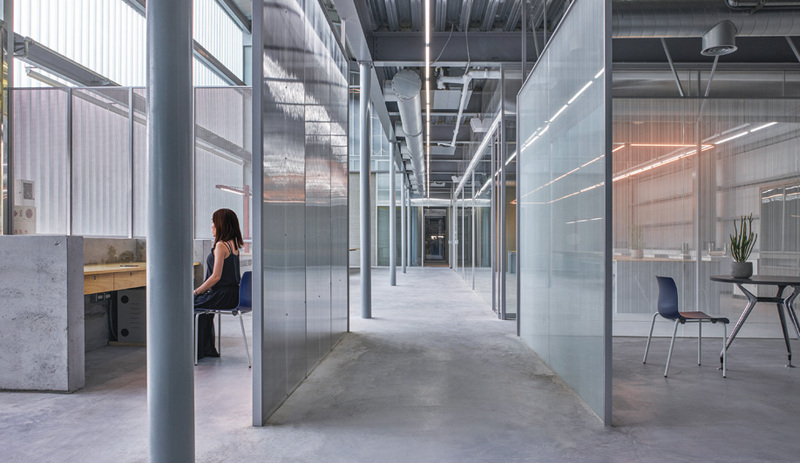 Wilkinson is known for blowing up corporate cubicle culture with open, expansive spaces that celebrate community. Here, he subverted the typical rectilinear office boundaries and introduced trapezoidal slices to parabolic effect, which is played out not only on the ceiling treatment but with bending walkways and seating areas set at an angle. The skewed grid generates a dynamic sense of movement throughout.